A well loved band in this area of course as band guitarist Steve Walwyn is a much loved local boy who as well as touring with the busy Feelgood schedule can be found performing with other bands and friends in smaller local venues and of course his famous ‘Kelly’s’ nights he puts on once a month at The Zephyr Lounge. The last time the band played the Assembly was back in 2011 and was my gig of that year, the band were on fire and the atmosphere was electric as the locals came out in force to support Steve and the band. 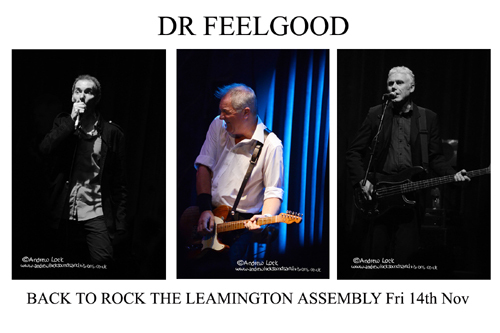 Being around for so long means Dr Feelgood have a fantastic selection of classic tunes to construct a quality set and the playing is always top notch. Returning as well for this date is the support from 2011 Nine Below Zero who also played a blinder last time around. Cannot recommend this gig enough and will again I am sure be one to remember.